Domestic lawyers are, above all, officers of the court. By contrast, the public international lawyer representing states before international tribunals is torn between loyalties to the state and loyalties to international law. As the stakes increase for the state concerned, the tension between these loyalties can become acute and lead to practices that would be condemned in developed national legal systems but have hitherto been ignored by international tribunals in international legal scholarship. 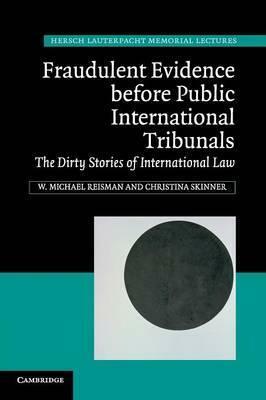 They are the 'dirty stories' of international law. This detailed and contextually sensitive presentation of eight important cases before a variety of public international tribunals dissects some of the reasons for the resort to fraudulent evidence in international litigation and the profession's baffling reaction. Fraudulent evidence is resorted to out of greed, moral mediocrity or inherent dishonesty. In public international litigation, by contrast, the reasons are often more complex, with roots in the dynamics of international politics. 1. The problem of fraudulent evidence before public international tribunals; 2. The sabotage cases: suborned witnesses; 3. Corfu channel: suppressed v. forged documents; 4. Tunisia/Libya: strategic omissions; 5. Nicaragua v. United States: false witnesses; 6. The Iran-United States claims tribunal: burdens of proof; 7. The Taba arbitration: duties of disclosure in the pre-arbitral phase; 8. Qatar v. Bahrain: massive forgeries; 9. Some concluding thoughts. W. Michael Reisman is Myres S. McDougal Professor of International Law at the Yale Law School, Connecticut. Christina Parajon Skinner is an attorney with Zuckerman Spaeder LLP, New York.